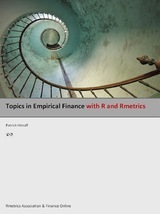 The book is a set of lecture notes used in a first year graduate course in empirical finance. The book focuses on the pricing and risk management of financial assets: bonds, options and other derivative securities. the systematic use of simulation as a way of validating modeling decisions or measuring various modeling biases. Patrick Hénaff is Associate Professor at Université Paris-I (Panthéon-Sorbonne), where he teaches market finance to MBA students. Prior to this, he spent many years in investment banking, in France and in the US, working in various quantitative research roles. Patrick is a graduate of the Ecole des Hautes Etudes Commerciales (HEC) in Paris, and holds a PhD from the University of Texas (Austin).